Blockchain has the potential to increase transaction transparency and reduce advertising fraud, but when might it become a viable solution? "If this is the year of big data and AI machine learning, it’s equally the year of the blockchain," Grant Allaway, managing director at ad2one, opened a panel session about the latest innovation in digital advertising. What is blockchain and can it solve the industry’s ad fraud issues? Ad fraud cost the industry $16bn last year, Allaway reminded the panel – this is a problem that needs an urgent solution. Blockchain is a digital ledger of transactions that’s open to anyone but non-corruptible. Kotryna Gasiunaite, product manager at ad-tech company Gravity 4, explained: "It’s a way of sharing information approved by people, not a centralised body… it’s a simple way to share information between different computers without knowing who it is." How does this work in practice? "In a blockchain, the ledgers cannot be erased and the database list only continues to grow. Data is protected by a "cryptographic hash", which is generated each time a new data entry is made to the ledger," said Allaway. Blockchain allows you to remove the gatekeepers and hand the power back to the consumer and the retailer. Allaway added: "With blockchain, there’s no need for intermediaries – that’s the exciting thing." Giving power back to users and consumers means people can control their own data and decide how it is used, rather than a third party making the decision. "It’s putting the dream of the internet back into the hands of the users," Allaway said. Cutting out intermediaries brings transparency to digital advertising. Issues over ad placements, fraudulent traffic and hidden ads signal a lack of financial transparency within the industry. Having an open access ledger that tracks the complete journey of an ad impression is the transformative advantage of the blockchain. 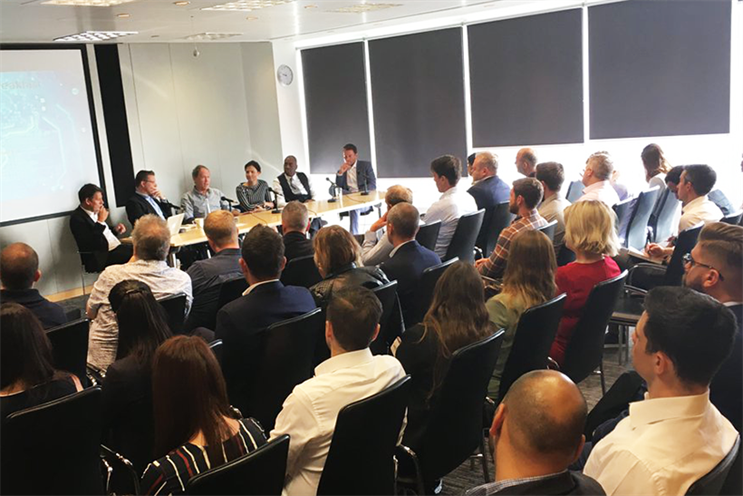 Farai Mativi, ad2one’s financial director, explained that "creating efficiencies and eliminating unnecessary points of service" is crucial for tackling ad fraud. But rather than a total overhaul of infrastructure, KPMG’s Chris Mills said that interoperability is key to introducing blockchain successfully into the mainstream. So it’s crucial to understand how to make blockchains interact with current tech: "You can’t just throw it all out," Mills said – billions has been spent on creating the infrastructures that exist today. The key is using blockchain to replicate business practices that exist in your chosen market. It’s all about improving the efficiency of the market, through providing better customer experience and interaction. "You have that distributed ledger – you choose who joins that club," he said. There is a lot of positive thinking around what blockchain can achieve: where ad targeting is not always being delivered as it should be and has been paid for, blockchain can offer transparency. As Mativi said "anything that eliminates bots and creates an environment of accountability and transparency is a very good thing for ROI". But there are doubts over its ability to deliver the volume of advertising at the pace the industry needs to make a fraud-free environment. While people are excited about its potential, Mills warned: "This is a very elevated goal – but what’s your value added next year and the year after?" There is an issue with speed in terms of request and delivery via blockchain explained Gasiunaite. "We are focusing on doing the groundwork around solving ad fraud issues like bots, auto refresh ads and hidden ads. Media owners should be driving this even more as it’s driving their CPM down… publishers should get more involved because we are talking about increasing their value." At the moment blockchain is still "evolving" according to Gasiunaite, "but it’s one of the best solutions" in the market for its potential to solve the ad fraud issue. "It’s accessible to everyone and you can adapt the blockchain for so many different industries." Gravity 4 and ad2one are 100% behind blockchain technology and via the Singapore entity LydianCoin PTE Ltd, are offering global digital ad services to ICO companies that would otherwise not have access to this.